CaptainKudzu: Why Federal Deficit Spending Will Never Be Fixed. Ever. Why Federal Deficit Spending Will Never Be Fixed. Ever. If there was any notion that the Trump Administration was fiscally conservative, those beliefs should be reconsidered in light of last week’s bipartisan spending deal and the president’s spending proposals from the State of the Union speech. Despite the Republican victory on tax reform, it seems that the party is veering toward massive spending increases rather than fiscal restraint and entitlement reform. Rand Paul (R-Ky.) was one of the few congressional voices that spoke out against the spending bill. In a speech on the Senate floor, Paul described why Congress is unlikely to ever resolve the problem of deficit spending. Ever. “The dirty little secret is that, by and large, both parties don't care about the debt,” the senator charged. The truth that Paul stumbled upon is that neither party can spend taxpayer money on its own. The Democrats want to spend on entitlements and social programs, but don’t have the votes by themselves. The Republicans have their own priorities, among them the military and up to $67 billion for President Trump’s border wall. Even though they have majorities in both houses, the Republicans don’t have the votes to pass a budget on their own either. On the other hand, when both parties come together in a bipartisan compromise, they have enough votes to spend like the proverbial drunken sailor. Neither party sees their priorities as frivolous. Both see themselves as patriotic lawmakers looking out for the wellbeing of their constituents. They agree to each other’s priorities to secure their own and the deficit goes up and the national debt continues to mount. There have been pauses in the trend. When Republicans won control of the House in the Tea Party wave of 2010, they kept a tight grip on the federal checkbook. Under Speaker John Boehner, the Republicans reduced spending in real dollar terms and reduced the deficit by 70 percent, thanks to the sequester’s spending caps. Nevertheless, the borrowing continued and the debt continued to grow, albeit at a slower rate. 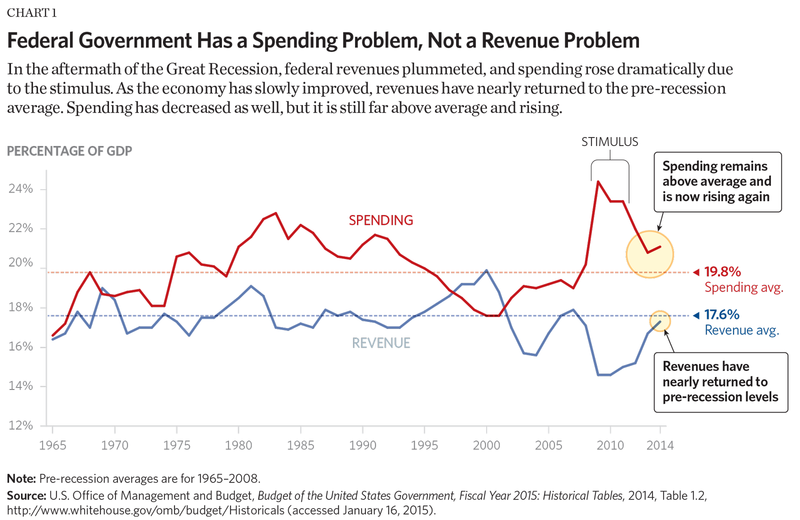 In the late 1990s, a booming economy paired with spending cuts actually led to federal surpluses for a few years. By the end of Barack Obama’s second term, the federal debt had almost doubled. The US debt to GDP ratio reached 108 percent. This is far behind Japan with a 240 percent ratio and Greece at 180 percent, but the level of debt is generally acknowledged to be at a serious problem. The Keynesian ideal of deficit spending in times of crisis has given way to deficit spending to avoid a financial crisis. Where Rand is incorrect is in his hostility to military spending, a constitutional mission of the federal government. Paul argues that “military spending more than doubled since 2001,” but fails to consider how much the world changed on Sept. 11, 2001. Two wars and numerous missions against Islamic terrorism are only the most obvious aspect of the problem. Chinese and Russian expansionism represent serious Cold War-like threats. In 2016, under President Obama, military leaders said that sequestration was a serious threat to military readiness. Budget cuts have led to difficulties in replacing and upgrading equipment. Financial limitations have also impacted training and troop retention. Military spending is costly, but it is not the largest share of the federal budget. Defense and security spending (including veterans programs) make up only 20 percent of federal outlays. Over half of the federal budget is made up of health care spending (28 percent) and Social Security (25 percent). It is entitlements that are breaking the federal budget. Speaker Paul Ryan is one of the few politicians of either party to dare to even mention entitlement reform. For his bravery, he is shown in Democrat ads pushing an old lady off a cliff. His own party was no better. When Ryan voted for the 2013 budget deal that included cuts in military retirement pay, he was skewered by Republicans even though the bill was supported by military leaders. In the end, Rand Paul is right. Neither party cares about the debt, at least not enough to allow cuts to their favorite programs, although they are more than willing to cut the other party’s pet projects. 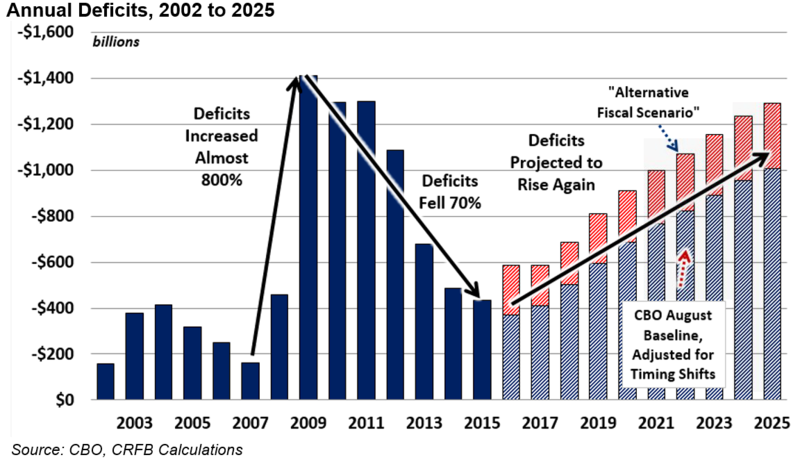 The minority party becomes a deficit hawk to use the deficit as a club to beat their opponents and roles reverse when the parties change control. The few politicians who want to make real spending reforms are opposed by both parties. There will be no spending reform for the foreseeable future. The US government will continue to spend like a billionaire’s wife in Saks Fifth Avenue as long as it can borrow. With the dollar maintaining strength and few other bastions of stability for world investments, many assume that purchases of treasury bonds will never stop. But one day, sooner or later, interest payments will combine with other budget items to exceed the government’s ability to borrow. The government will not be able to pay its bills. When that day comes, members of both parties will have to get serious about spending cuts regardless of what their voters think. The Biggest Problem With "50 Shades"
Joy Behar: Christians Are "Mentally Ill"